Exporter of a wide range of products which include l-alanyl l-glutamine injection. 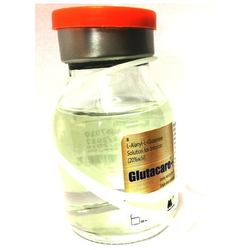 Adult Dose: As solution containing (Glutacare 50ML) L-alanyl-Lglutamine 200 mg in each ml. Dose depends on severity of the catabolic state and amino acid requirement, not to exceed 2 g amino acids/kg/day in parenteral nutrition, amount of (Glutacare 50ML) amino acids supplied through L-alanyl-L-glutamine should not exceed 20% of the total supply. To be mixed with a compatible amino acid carrier solution or an amino acid containing infusion regimen before admin. Max treatment duration: 3 wk. Mechanism of Action:Dipeptiven contains dipeptide L-alanyl-L-glutamine which is used in parenteral nutrition. It is split endogeneously into the amino acids glutamine and alanine. It is usually used in patients in hypercatabolic and/or hypermetabolic states. Absorption: Compound is rapidly split into alanine and glutamine after infusion. Intravenous: Store below 25 DegreeC. Looking for L Alanyl L Glutamine Injection ?